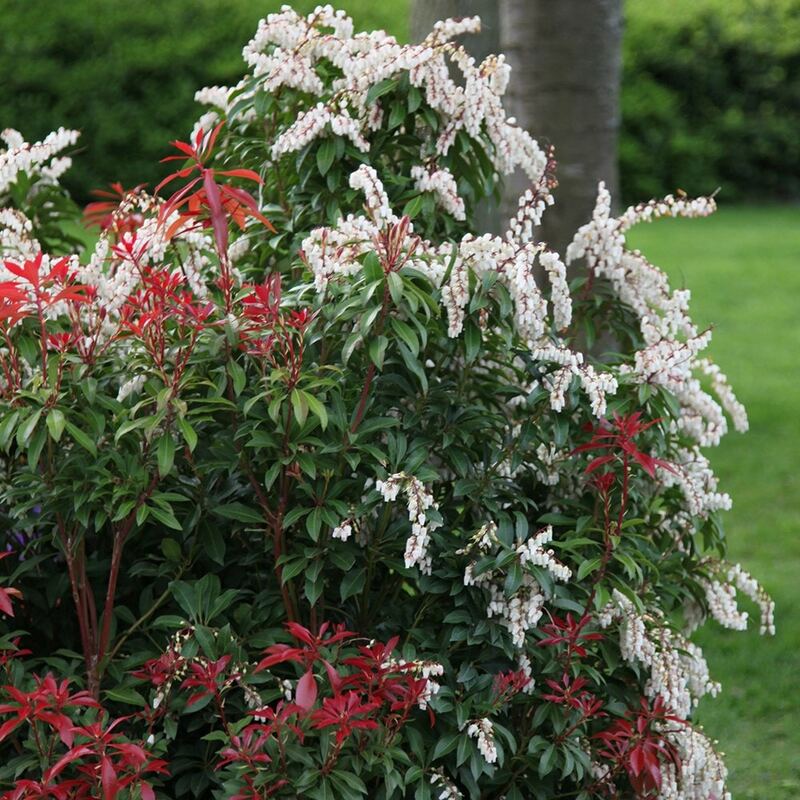 Glossy, brilliant red young leaves gradually turn pink, creamy white, then dark green. In late spring, clusters of pretty, ivory, nodding bell-like flowers appear, resembling lily-of-the-valley. The fiery red young foliage of this upright evergreen shrub will add a splash of vivid colour to a shady shrub border or woodland edge. 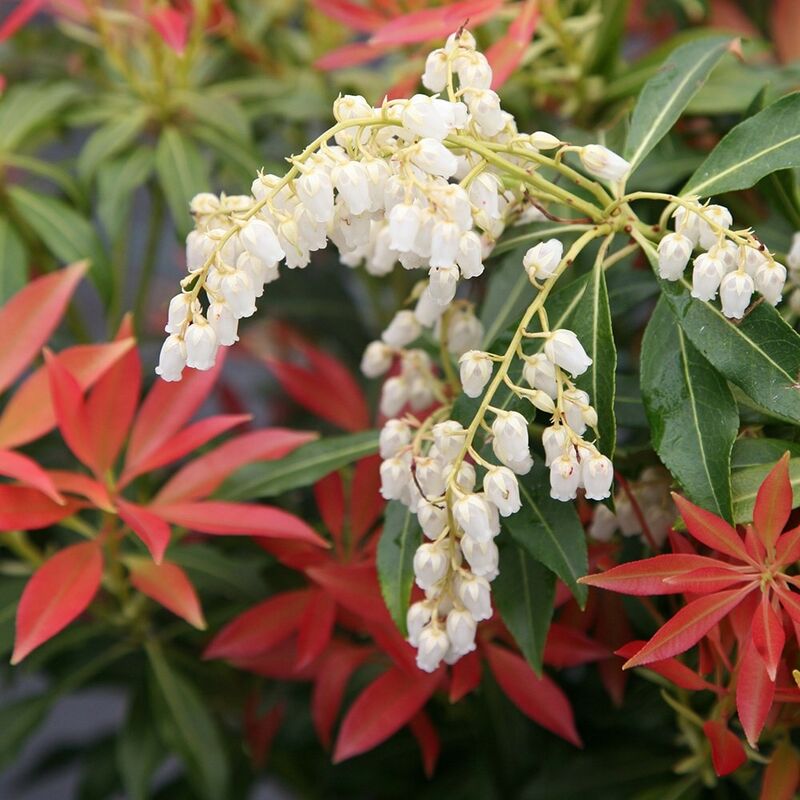 One of the best varieties, this Pieris needs a moist, well-drained acid soil and shade from morning sun. Garden care: Add composted pine needles or ericaeous compost when planting and apply a generous 5-7cm (2-3in) mulch each year around the base of the plant in early spring. Remove the faded flower-heads in late spring along with any frost-damaged foliage. Do bees like Pieris Forest Flame? I note that neither your site, nor the RHS mark it as so (no 'perfect for pollinators' badge, yet other pieris are marked as good for pollinators. I also saw that the Gardener's World site does mark Forest Flame as good for bees, although not other polinators? Hello, No, this is not as attractive to bees as the Pieris formosa or P. japonica types. Hi, I see the plant is delivered in a 2 litre pot but can you say what size the actual plant is? Hello, Each batch we get in will be slightly different, but as a very general guide, I would say they are between 20 - 30cm in height. Hello, provided you make sure it is done carefully without causing too much root damage, then it should not be a problem at all. Hi, my forest flame is planted in the shade but the only really healthy bit is right at the bottom, it used to be planted in full Sun and seemed to look really healthy then. Should I be pruning it sometime, it just looks really bare and unhealthy.